With autumnal equinox receding in the rear-view mirror here in the Northern Hemisphere, we’re entering a period of chilly (not to mention gloomy and rainy) weather. Which is good news, in a way. Because chilly season means chili season. During the cooler months, we have chili frequently—at least once a week. And although we make chili using all sorts of ingredients (including a mean vegetarian Sweet Potato Chili with Black Beans), there’s something special about a chili that’s heavy on the meat. And when it comes to meatiness, nothing beats Texas chili. It typically contains loads of meat and chilies—and not much else. Just the thing to take the chill off. In a state as vast as Texas, no single chili recipe can be considered “the” authentic one. The varieties of chile peppers used in west Texas differ a bit from those used in east Texas, for example. But there is one constant: Traditionally, Texas-style chili contains no beans (though you’ll sometimes find Texas chili served over beans). Some purists also say there should be no onion or tomato in Texas-style chili. Frank X. Tolbert has an excellent recipe for just such a spartan chili in his book, A Bowl of Red (a history of Texas chili). But we’ve lived in Texas ourselves—and can report that we were served plenty of chili that contained onions and/or tomatoes. Even Lady Byrd Johnson’s recipe for Pedernales River Chili contains both these ingredients. What really distinguishes Texas chili from most other kinds is the minimal liquid it contains. It’s not at all soupy, so the flavor of the meat dominates. Our recipe contains onions (and some garlic), but no tomato. But feel free to substitute tomato for beef broth if you wish—that makes a really good variation. Active prep time for this recipe is 45 minutes or so. Cooking time adds at least another 2 hours (most of it unattended). This recipe yields 6 to 8 servings. It’s easy to double the amount if you’re feeding a huge crowd (this dish is excellent for a football tailgate, BTW). If the recipe makes more than you can use at one time, leftovers freeze well. This is a great make-ahead dish. The chili gains flavor if it spends the night in the refrigerator, and is then reheated the next day. If you’re using dried red chile peppers, you should start by preparing them: Wipe the chilies with a damp paper towel to remove any dirt or dust. Then place the chilies in a skillet over lowish heat and toast them until fragrant (usually 2 minutes or so; don’t overtoast—they’ll become bitter). Remove the toasted chile peppers from the skillet and place them in a bowl. Cover the chilies with hot water (preferably boiling) and soak them for 30 minutes. While the chilies are soaking, you can move on to prepping the meat (Step 3 below). Or if you’d like to complete the chile preparation before you go further with the recipe, proceed to Step 2 once the chilies have finished soaking. Now prepare the meat (as noted above, you can start this process right after Step 1 if you prefer): Pat the meat dry with paper towels, then cut it into chunks of ¼ to ½ inch. Salt the meat to season it. Heat a frying pan (cast iron is ideal) and add enough oil or lard to just cover the bottom of the pan. Add the chunks of meat to the pan and brown them thoroughly on all sides (this will takes 5 minutes or a bit less—smaller pieces brown more quickly). Don’t overcrowd the pan, since the meat won’t brown well if you do. You will probably need to brown the meat in two or more batches, adding more fat to the pan between batches if necessary. When each batch of meat is fully browned, remove the chunks of meat to a plate covered with paper towels (so the grease can drain). While the meat is browning, peel and dice the onions. Warm a large cooking pot or Dutch oven—a 4-quart size is good—over medium heat (this is what you’ll be using to cook the chili). When the Dutch oven is warm, add a tablespoon of olive oil or lard and allow it to heat (it will shimmer when it’s hot). Then add the diced onions, season with salt, and cook until the onions are just on the verge of browning (5 to 8 minutes). While the onions are cooking, move on to Steps 5 and 6. Peel the garlic and mince it finely (or slice it thinly). Wash the jalapeño peppers (if using) and cut them lengthwise (you may want to wear rubber gloves while doing this step). Use a teaspoon to scoop out the ribs and seeds (be careful, the oil on these is hot; keep fingers away from your eyes). Chop the peppers into very small dice (or use a mini food processor). Place the peppers in a bowl until you’re ready to use them, then wash your hands with soap and water to remove the hot jalapeño oil from your skin (if you didn’t wear rubber gloves). You may want to reserve a slice or two of jalapeño for garnish. When the onions are on the verge of browning, add the chopped garlic and jalapeño and cook them for a minute or two. Add the browned meat to the Dutch oven or cooking pot, along with the chile mixture from Step 2. Add the cumin, coriander, and oregano, and stir the mixture. Allow to simmer for a few minutes. Next add the beef broth: Start with 2 cups or so, just enough to barely cover the meat (though you’ll probably need to add more as the chili cooks and the liquid evaporates; you don’t want to cook away all of the liquid). Bring the mixture to a boil, then reduce to a simmer. Partially cover the pot with a lid, leaving a crack. Set a kitchen timer for 30 minutes. Allow the chili mixture to simmer until the timer goes off, then taste the sauce. Add salt if necessary. If you want a spicier chili, you can add some dried chile powder (ancho would be good) or a bit of hot sauce. Cook the chili at a simmer for at least another hour and a half (it tastes good after 2 hours total cooking—but even better if you cook it for 3 or 4 hours). Add more beef broth (or water, if you run out of beef broth) during the cooking process if the liquid seems to be evaporating too quickly. When you’re ready to serve the chili: If the mixture is too soupy, you can add some masa harina (say ¼ cup) or cornmeal and let it cook for 10 or 15 minutes—that should tighten up the chili. Or just cook the chili a bit longer (what we usually do) to let more of the liquid evaporate. Or just serve a bit soupy—it's good that way, too. We like to serve this chili with a garnish of jalapeño pepper slices. Chopped onions or grated cheddar cheese work well too. Oyster crackers are a classic accompaniment. A refresher on terminology: A “chile” (with an e) is a pepper; the plural is chilies. Chilies can be either fresh or dried. When you dry chile peppers and grind them up, you produce chile powder. Chile powder contains nothing but chilies. By contrast, chili (with an i) powder is a mixture of herbs and spices that includes chile powder as one of its ingredients. Peppers and powders can both be used to flavor the dish called “chili.” Totally clear, eh? Ancho, guajillo, and pasilla chilies and are the most common varieties you’ll find wherever whole chilies are sold. Many supermarkets will carry at least one of these. 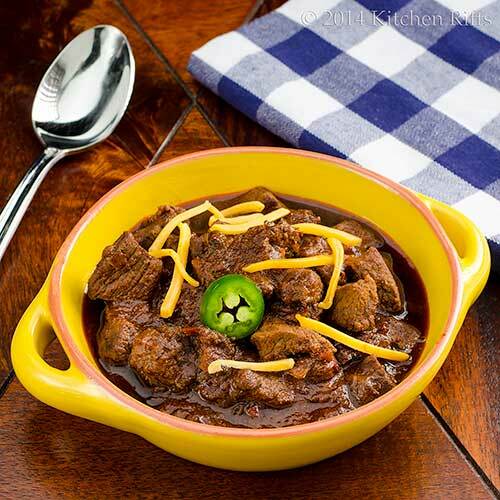 Ancho is the mildest, and also the variety most often found in Texas chili. Worried about the heat level of the chilies? Then use no more than 6 whole chilies the first time you make this dish. If the resulting chili is too wimpy for your taste, it’s easy enough to add dried chile powder as the dish cooks. Don’t want to mess with whole chilies? Just substitute 2 to 4 tablespoons of chile powder instead. Definitely use ancho (it’s traditional in Texas chili). These days you can find ancho chile powder in almost any supermarket. It has great taste, and is fairly mild. We also like to add some medium Hatch chile powder. And if you want to kick things up a bit, add some chipotle chile powder too. When we don’t use whole chilies, we find that two tablespoons of chile powder yields a fairly mild chili (so we generally increase the amount to four tablespoons). You may prefer less spice than we do (or more). That’s why in Step 10 we have you taste the chili—so you can adjust the seasoning. You can also substitute chili powder for chile powder(s) in this recipe. As noted above, however, chili powder contains seasonings in addition to dried powdered chilies. If you go this route, use 3 to 5 tablespoons of chili powder. Reduce the cumin, coriander, and oregano by about half, or eliminate them altogether (since these flavors generally are incorporated into chili powder). The taste of the finished dish won’t be as crisp if you use chili powder, but you’ll still be pleased with it. For this recipe, you should use a cut of meat that will hold its texture during the long cooking process. We like to use chuck roast, which is flavorful and relatively inexpensive (and when you cut up chuck roast, it’s easy to follow the natural muscle separations, which makes things go faster). But any stewing cut of beef will work. Top or bottom round also works well. If in doubt, tell your butcher what you want to make—he’ll have some suggestions. And if you don't want to cut up your own chuck roast, the butcher can do that for you, too. Instead of oil or lard, you may want to substitute rendered bacon fat in this recipe—it adds excellent flavor. (You can even use the bacon from which you rendered the fat; just chop it up and toss it into the cooking pot). Instead of beef broth, we often use beef base (we add water to the base to make “stock”). Beef base is stock that’s been cooked down until it becomes a paste—and we think it’s better than most canned broths. You can usually find beef base in the soup aisle of your supermarket. We like the brand called Better Than Bouillon, but there are other good ones out there. (BTW, we receive no compensation for recommending this brand; we’re just enthusiastic users of their products.) You can also substitute plain water for beef broth or base—though of course this will have less flavor. Kosher salt is more coarse than regular table salt, so it’s less salty by volume. If you’re substituting table salt for Kosher, always use less—about half as much. If the dish isn’t salty enough for your taste, you can always add more later. Cooks have developed many variations on Texas chili. Some include beer or strong coffee as part of the liquid. Some add chocolate and/or cinnamon (or allspice) to the mix. Some cooks like to cut the beef into chunks of 1 or 2 inches (too big in our opinion—how do you fit that on a spoon?). Others prefer to grind the beef coarsely (a ¼- or ½-inch grind would be about right). The bottom line? There are lots of ways to make “authentic” Texas chili. “What intense flavor!” said Mrs. 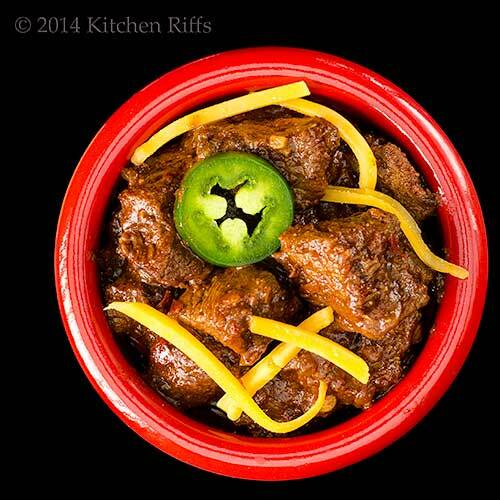 Kitchen Riffs, spooning her Texas-Style Chili con Carne. “It’s a perfect dish for watching football,” I said. “Too bad your favorite teams are the St. Louis Rams and the Tampa Bay Buccaneers,” said Mrs K R.
“Well, a hearty bowl of this chili would definitely make their games more palatable,” said Mrs K R.
“Especially with a brewski or two,” I said. “Don’t remind me,” I winced. The Chili looks perfect for this rainy weather. I liked how you used the chunks of meat. The ingredients you used in this recipe makes it a very flavorful Chili. We have had some amazing weather in Denver and if not for the chill that washes over us once darkness settles in I could imagine it's much earlier in the season than it is. Which I love but I also know this...the cold is coming and when it does I want chili. Nothing better than chili with chiles and meat. Nothing! As a born and raised Texan I have eaten every kind of chili that you can imagine. The only hard and fast rule being that real Texas chili NEVER contains beans. I love your use of chunks of meat although I do like very coarsely ground too. The color of yours is perfect. I think even my dad would approve and he was the official chili cooker in our family. Hi Shibi, it's been gloomy here, so this has been wonderful! And chunky chili is fun to eat -- great texture. Thanks for the comment. Hi Barb, chili really warms you up, doesn't it? I love the stuff! Thanks for the comment. Hi Karen, I almost went with a coarse grind for this dish, but chunks are more fun (a bit better mouth feel, IMO). And I do like chili with beans -- but I don't call it Texas chili! Thanks for the comment. This is on my list of dishes to make and I am glad you shared a great recipe with notes about authenticity and tips about cooking it. This will be a great crowd pleasing tail gate dish! Thank you! The gloomy weather has arrived here today, John and let me tell you, you couldn't have chosen a better day to share stick to the ribs Texas Chili! I LOVE the stuff! As a matter of fact, I have Tolbert's book around here somewhere, lol...Unfortunately, Marion does not feel the same way about Chili but when my son-in-law visits, look out!!! Wow John, I love the idea of really meaty chili...this sure looks delicious and packed with flavors...great for a cold evening meal. Hi Ansh, this really is a great recipe for a football game! And really good flavor -- it's a winner! Thanks for the comment. Hi Louise, Tolbert's book is really entertaining -- I hadn't read it for years, but pulled it out when I was writing this post. Really fun read! And your son-in-law will love this stuff. You too, of course. :-) Thanks for the comment. Hi Juliana, it really doesn't get meatier than this! It's really good stuff -- perfect for cold weather. Thanks for the comment. Afternoon John , it's time for chili and your will be the first of the season . Chili season at my house starts after Columbus Day . I like the idea of the chunks of meat , and of course it will have onion and garlic . I think I will make your rolls to go along . Dinner is complete . Thanks for sharing :) ... I am pinning . This looks super delicious and comforting, ideal for both Autumn and Winter! HI John, it's in the nineties here today but I could eat this chili anytime of year, looks great! Yay for chili season! This recipe is awesome, I love how you start with the actual dried chilis --- and this has to be the meatiest version I've ever seen, love it! Man oh man does that have my mouth watering! It looks flavorful, hearty, and so delicious! Hi Dottie, isn't chili wonderful? We can't get enough of it in chilly weather. :-) Thanks for the comment. Hi Charlie, wow, thats some difference in weather! And even though I didn't use tomatoes in this particular batch, I think they go wonderfully well in chili. Thanks for the comment. Hi Nee, I don't think it's chili without onion and garlic! Just not the same for me. The rolls would go great with this! Thanks for the comment. Hi Denise, it really is comforting -- great food for this time of the year. Thanks for the comment. Hi Cheri, when we lived in Florida and it was hot we'd eat chili anyway, just because we love it so! But it's particularly nice when it's cool, I think. Thanks. for the comment. Hi Sue, yay indeed! My favorite season. :-) Thanks for the comment. Hi Pam, it was making my mouth water too, as I was making it! Really good stuff. :-) Thanks for the comment. Now that's a bowl of chili!!! Interesting discussion on authentic Texas chili. No onions nor tomatoes? How on earth do you make chili without onions? How do you make ANYTHING without onions? :) Even with onion in the chili, I still would put some raw onion on top. Love the big chunks of meats rather than ground beef. I'm usually not a big Texas chili fan, but your bowl has me wanting to make a pot. Great recipe John! Thanks! Hi MJ, I'll never make chili without onions! I've tasted versions without, and they're OK (anything with loads of chile flavor is going to be OK). But versions with onions have much more depth. And I like tomatoes, too. Thanks for the comment. Just what I want to curl up with while watching the SF Giants win on TV. LOL It really is a great dish just made for a lazy day of sports watching. Hi Carolyn, oh sure, rub it in. ;-) And chili and sports just seem to go together, don't they? Thanks for the comment. Stewed meat is by far one of my FAVORITEEEEEEEEE things ever!!!!! So tender and juicy, just melts in your mouth! I haven't seen such a wholesome chilli con carne for a while, it is always so watery and boring when my friends order it! This looks delicious - and be sure to enjoy it while you watch Kansas City playing in the World Series! Damn delicious and comforting spicy chili con carne!!! Love that this uses dried chilis. Perfect, perfect dish for fall and winter. Now this is chili! It is amazing how taking the time to grind your own chilies can add so much! Manservant would eat chili every day if I made it. Thanks, John. This is superb! Hi GiGi, I know how excited this recipe must make you! :-) Thanks for the comment. Hi Kumar, this really is soul-warming food! And tasty, too -- who can beat that? Thanks for the comment. Hi Uru, there's very little sauce in this chili, that's for sure. A real nice treat! Thanks for the comment. Hi Beth, alas, I think you're right that KC is the only team from Missouri that will be in the series. But we lived in KC long ago, and like it a lot, so it'll be fun to watch the Royals. Thanks for the comment. Hi Dedy, this truly is delish, and very rich. Really, really good. ;-) Thanks for the comment. Hi Debra, it's fun playing with whole dried chilies, isn't it? Such great flavor! Thanks for the comment. Hi Rocquie, there are countless versions of "real" Texas chili, thus the passionate discussions -- everyone is convinced "their" chili is the only true version. They're all good, say I! Thanks for the comment. Hi Abbe, I could probably eat chili everyday too, but pretty soon I'd outgrow all of my clothing! It'd be worth it, though. ;-) Thanks for the comment. Hi Pat, it really is delish! And Texas chili has so many different variations -- you could spend a lifetime, and probably not try every one! Thanks for the comment. I didn't realize on meaty Texas chili is. This would definitely appeal to both my sons. Thank you for the discussion on chilies----mild---not so mild----substituting amounts etc. Giving you one Poor Baby because of your teams being bottom feeders. Hi Carol, yeah, both of those teams really stink. But why should this year be any different? ;-) The whole subject of chilies is really interesting -- so much to learn! Thanks for the comment. This is so my kind of recipe! Really excite to check it out! Hi Laura, isn't this a fun dish! Loads and loads of flavor! :-) Thanks for the comment. Hiya John... mouth is watering at the thought of chilli with chunks of meat like that! I must, must, must try this! Many thanks for a great recipe. John, terrific write-up about chili, Texas chili, and the distinction of chile peppers. I'm loving the beef taking center stage in your recipe, but the slice of jalapeno has me smitten. I haven't had chili in a long time, but with the cooler weather coming now it sounds so great! 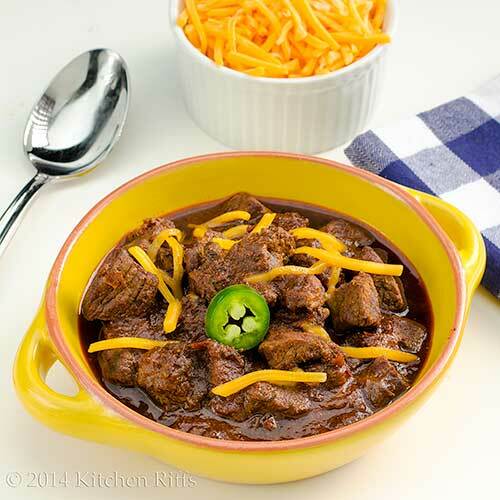 I love adding cumin and coriander - they give such an amazing color - like this texas chili con carne has! We are totally on the same page today! Not only did I post chili but talked about how it means "Fall" to me. This one looks amazing - I love all of those dried chilies you start with!! Hi Lizzy, a chili rich with meat like this is a treat now and again! Thanks for the comment. Hi Brooks, beef has a way of stealing the show when it's on the menu, doesn't it? Thanks for the comment. Hi Kristi, chili and cool weather are just made for each other, I think. Thanks for the comment. Hi Shashi, after cinnamon, cumin is my favorite spice! And who can resist coriander in a dish like this? Thanks for the co;mment. Hi Alyssa, ooohhh, dueling chili! I'll definitely be checking out yours. :-) Thanks for the comment. Now, this is chili!! Like you, I prefer a chunkier meat in my chili but certainly not beyond spoon-size. That's treading into my stew territory. Thanks, BTW, for naming the varieties of red chiles that you use. Many recipes require "red chiles" and I've no idea which to use. Given that the markets I frequent don't have a wide selection, I'm usually left with jalapeños or red Thai. Now I know what to look for and, if not available, I can check out the dried ones. Most stores have a plentiful selection. Thanks, John, for both the great recipe and helpful info. I shall walk into the aisle of dried chiles and I shall fear no pepper. Hi Amy, chili is one of our go-to meals at this time of the year, too. Can't get enough of the stuff! Thanks for the comment. Hi John, there are an awfully lot of varieties of chilies out there! and all of them good. The ones I mentioned have are particularly good in chili, IMO. Thanks for the comment. Now that's a meaty, hearty chili. Love it and love that there are so many delicious varieties of chili. It's one thing that I kind of forget about. Thanks for a fabulous reminder that it's chili season! Gorgeous!! I need a big bowl of this. So going to make this! Thanks for sharing. oh see now that's how I like my chili, with chunks of beef, not hamburg, but beef. once I made a chili with short rib meat--heavenly I tell you! That looks like a super hearty (chunky) chili con carne. I have never experimented using whole meat before, it is often made with mince here in OZ. Hubby is going to love this recipe, thanks. Hi Chris, I always look forward to chili season! My favorite time of the year. :-) Thanks for the comment. Hi Asmita, you're so going to enjoy this! :-) Thanks for the comment. Hi Dawn, chili made with the meat from short ribs? That does sound like heaven! I gotta try that sometime! Thanks for the comment. Hi Liz, minced meat is the usual, but chunky really is nice. And it's ideal for Texas-style chili, IMO. Thanks for the comment. Hi Nami, chilly season is good, isn't it? :-) And chunky is always the best! Well, when it comes to chili, that is.Thanks for your comment. Oh yes! I'm a huge fan of chili con carne, but I've never tried a texas style one! This is so great! Hi Marcela, it's definitely worth trying the Texas-style version of this dish at least once -- really good flavor, and loads of meat! Thanks for the comment. What a coincidence, my husband was just asking me to make some Chile con Carne for him the other day. Most of the supermarkets in Chula Vista, California have all the chiles; I love looking at all of the ancho and arbol chiles on display. Ooh--so you were a Texas resident once as well? No wonder you know your chili so well! Excellent showing here! Hi Fran, I love looking at chile displays too! They're so pretty, aren't they? Thanks for the comment. Hi Ala, we did indeed live in Texas for a few years. And ate a lot of chili there. :-) Thanks for the comment. Odd that my comment just seemed to disappear. Anyway, this could be a duplicate. Just wanted to say I had no idea beans weren't a necessary chili ingredient, but I could see with all that delicious looking meat, why you wouldn't want to add them to this chili. Hi Kristi, I actually prefer chili with beans, but traditionally they aren't included in Texas-style chili. So although I like this dish, a lot, tend to make more kinds of chili where beans are an option. Thanks for the comment. Aha! Now I would add the tomato and leave out the onion. There is a special something to chili con carne and we all turn back to it time and time again. This looks very tasty, John! I didn't know chili con carne came with different versions. I definitely agree that chillies are a great idea to heat up from the cold. Hi Suzanne, chili con carne really is good stuff, isn't it? And onions or no, tomato or no, it's all good. ;-) Thanks for the comment. Hi Julie, although there are all sort of variations for chili con carne, I guess at heart it's all the same dish. Good, no matter how you make it! Thanks for the comment. Hi Helene, I guess with your climate chilly weather doesn't come around all that often! But this is good in hot weather too -- just add more chilies. :-) Thanks for the comment. Hi Greg, I've not had chili with tofu. And I'm not likely to, either! :-) Thanks for the comment. I make my chili with ground beef, but next batch will be with chuck. I'd have to add onion and tomatoes...can't wait to give it a try! Hi Liz, chili with chunky chuck has soooo much flavor. :-) And although I didn't include tomato in this recipe, it really does make a good chili. Thanks for the comment. 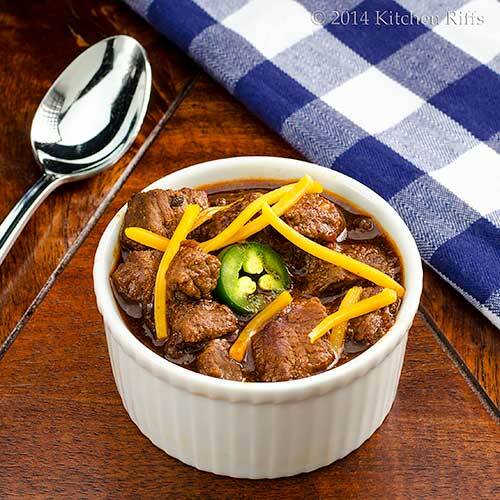 I'm not looking forward to the chilly weather, but chili I'm OK with :) Great recipe! Hi Ashley, I like chilly weather, but not real cold weather. But I'm with you -- chili any time! :-) Thanks for the comment. You have chili once a week? Wow. I think my hubby would like to move in with you! We eat a lot too, esp during football season but I can't do it every week. Though, I make mine with beans and maybe that's the problem! I do use stew meat like you do and I think I would like yours! I could possibly eat it every week :) Looks fantastic. Hi Raymund, I really like the chunky texture of this, too. And the flavor is awesome! Thanks for the comment. Hi Nazneen, when we make chili, we always make a big batch and freeze it much of it. So it's easy to pull some out of the freezer for a quick dinner. Also, we make a lot of vegetarian chili, so it's not always a meat chili each week. But I definitely could eat this once a week! It's really good. Thanks for the comment. Can you believe that, even I live in Latin America, I've never prepared chili con carne before? But with your perfect recipe, I will. Thanks for sharing this great, comforting treat for colder days. Those Texans and their Chili. All I know is that I've heard no beans ever should be found in Texas Chili. Thanks to you, I'm now craving chili and I've not made it yet this year. Hi Daniela, with the great beef you have there, this dish is a natural! Thanks for the comment. Hi Lea Ann, I think the no beans thing is the main deal when it comes to Texas chili. Although beans in chili are awfully good! Thanks for the comment. Love this no bean version. Chunky, comforting and warm. Hi Lail, isn't this nice? Loads of flavor, tons of comfort. :-) Thanks for the comment. I have read that in Texas that they don't use beans in their chili. I have never had this type of chili before. I love your recipe, it sounds like it would have a ton of flavor and I love the beef. Hi Dawn, this chili definitely has a ton of beefy flavor to it! And that's a good thing, IMO. ;-) Thanks for the comment. Hi Kiran, it really is delish! This batch is gone -- we need to make another. ;-) Thanks for the comment. How perfect for a tailgate party. I've never seen a tailgate party in Australia but I sure do remember them when I lived in Knoxville. Before every UT game it was car to car parties in the parking lot. Hi Maureen, tailgating is huge on fall Saturdays (college football) and Sundays (professional). And chili is a staple at many of those tailgates! Thanks for the comment. We are in month six of of low-carb. I have already bookmarked this - in MN one needs hearty dinners and the usual comfort of mashed potatoes an peans and pasta will derail all of our previous deprivation. Love the difference in chili/chilie powders. Had no idea. I am woefully ignorant when it come to Texas cooking but more than happy to eat it! Also loves that it freezes. Yes, this will be made! Hi Claudia, this is a wonderful dish! And perfect for low-carb. Thanks for the comment. Hi Terra, this chili sure packs a lot of flavor into each bowl! Really good stuff. :-) Thanks for the comment.